. . . Another disappointment is David Bentley’s essay on Frye’s contribution to the criticism of Canadian literature. The punning title “Jumping to Conclusions” is meant to be at Frye’s expense, but it applies much better to Bentley’s own argument. The essay consists almost entirely of passive-aggressive innuendo: the suggestion, for example, that Frye’s views were the outgrowth of neurotic anxieties about nature and animals, or that he was out of his league as a critic of Canadian literature and culture. How credible is the latter charge about a critic who for a decade annually surveyed the entire yearly output of Canadian poetry for this quarterly? Frye’s intricate knowledge of the Canadian scene–the whole scene: not just literature, but culture, politics, and history–is manifest to anyone who has made his way through the daunting volume of essays in Northrop Frye on Canada (vol. 12 of The Collected Works), which brings together his diverse writings on Canada. Most egregiously, Bentley’s essay never really confronts the argument of the epochal ‘Conclusion to a Literary History of Canada’; he simply hints at its contradictions and inaccuracies by quibbling over passages that he does not properly contextualize. Sadly, as Eleanor Cook observes in her essay in the other volume reviewed here, ‘for fifty people who can repeat the phrase “garrison mentality,” only one can repeat the critical argument in the”‘Introduction” to The Bush Garden and get it right.’ At the same time, Bentley conspicuously ignores Frye’s changing view of Canadian literature. Frye’s views altered as the quality of Canadian literature itself did with the emergence of writers like Margaret Atwood and Alice Munro. Frye, it seems, will never be forgiven for pointing out the limitations of Canadian literature before the seventies. Frye observes that the early literature of Canada’s European inhabitants is marked by a “garrison mentality,” a protective and hostile attitude reflecting a “deep terror in regard to nature” (225). He further relates this sense of solitude–the experience of the isolated individual or parochial community of being surrounded by a menacing environment–as linked to the important tradition in Canada of the “arguing intellect” (227) of partisan, rhetorical and ideological argument. The latter is opposed to the “disinterested structure of words” (228) that we find in poetry or fiction, and its dominance is a sign that Canadian literature does not yet constitute a unique tradition but is in large part somewhat sub-literary. The Canadian writer has the difficult task of adapting the highly organized body of European verbal culture to what is essentially an alien natural environment. She or he must create a tradition of fiction and poetry in a cultural context not entirely conducive to it, one which, because of this sense of solitary adversity, has tended to favour realism over romance. “The conflict involved is between the poetic impulse to construct and the rhetorical impulse to assert, and the victory of the former is the sign of the maturing of the writer” (231). Frye’s point is that for a mature literary tradition to develop, imaginative writers must detach themselves from the natural and social world out there and find their “identity within the world of literature itself” (238). One obstacle to such a detachment was the deeply rooted perception in the Canadian literary tradition of the natural world as something unconscious, indifferent, and even hostile to human concerns. The problem is that such a vision of nature is finally a projection of the unconsciousness and the death-wish in human beings themselves. For Frye, the first poet to emerge from this tradition and show signs of a mature vision was E.J. Pratt, “with his infallible instinct for what is central in the Canadian experience” (226). In Pratt’s poetry, we are witness over and over again to the struggle of human dignity in the face of this death-wish in nature and man, perhaps most dramatically set forth in Brébeuf and his Brothers. When Canadian poets begin to find their identity in the world of literature, what they envision is a recreation of nature, a social and natural world transformed according to the models of the city and the garden projected by the poetic imagination. 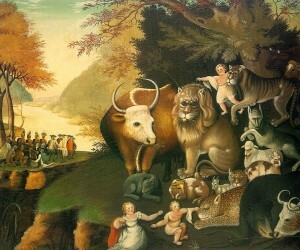 In the embryonic Canadian tradition, this depiction of the heroic struggle of the solitary individual or group against a terrifying natural environment contains the seeds of what Frye calls the pastoral myth, with its social ideal of “the reconciliation of man with man and of man with nature” (249). This ideal represents the return of the repressed vision of innocence associated with childhood, which tells us that the objective world is ultimately a lie and that the invisible world of the imagination is what is real; it is the “quest for the peaceable kingdom” (249) that Frye speaks of in the closing passages of that essay, and which he finds in Edward Hicks’ painting depicting the Messianic prophecy of Isaiah with its “haunting vision of a serenity that is both human and natural” (249). Atwood, Margaret. Tribute. A Service in Memory of H. Northrop Frye. Convocation Hall, University of Toronto. 29 January 1991. Printed in Vic Report. 19.3 (1991): 7. Frye, Northrop.—. The Bush Garden: Essays on the Canadian Imagination. Toronto: Anansi, 1971. —. Divisions on a Ground: Essays on Canadian Culture. Ed. James Polk. Toronto, Anansi, 1982. —. On Education. Markham, On: Fitzhenry, 1988. This entry was posted in Uncategorized on January 6, 2013 by Joseph Adamson.